The Associated Press reports several earthquakes in eastern Ohio that have been linked to shale gas extraction. If true, this represents the 4th time that hydraulic stimulation in shales has been associated with seismic activity. This follows Preese Hall, Lancashire, the Horn River Basin, Canada, and Garvin County Oklahoma. Note that it is important to differentiate between earthquakes triggered by hydraulic stimulation (i.e. fracking) and those triggered by underground disposal of large volumes of waste fluids, which is not being considered in the UK. It is the underground waste disposal wells that have been attributed to the increase in mid-continental seismicity seen in the USA. Are these events the first known earthquakes of this character in the region? Is there a clear temporal correlation between injection and seismicity? Are epicentres near wells (within 5km)? Do some earthquakes occur at or near injection depths? If not, are there geologic structures that may channel flow to earthquake sites? Are changes in fluid pressure at the well toe sufficient to induce seismic activity? Are changes in fluid pressure at hypo central locations sufficient to encourage seismicity? However, without good quality seismic data, these questions can be difficult to answer. 1. Ohio DNR provides a handy interactive earthquake map. The recent events are in the east of Mahoning County, on the border with Pennsylvania. In 2010/2011 a series of earthquakes occurred a few km to the northwest. These Youngstown events were associated with a waste disposal well. More seismicity is located 50km to the north. Again, many of these events have been linked with injection wells that were active in the 1980s/90s, disposing waste from chemical plants in Ashtabula and Perry. So these are not the first events of this character in the region. However, the majority of seismic activity in the region is injection induced. 2. Injection schedules are not publicly available for wells in the area. However, the fact that the DNR have linked the events to hydraulic stimulation would imply that a temporal correlation exists. 3. 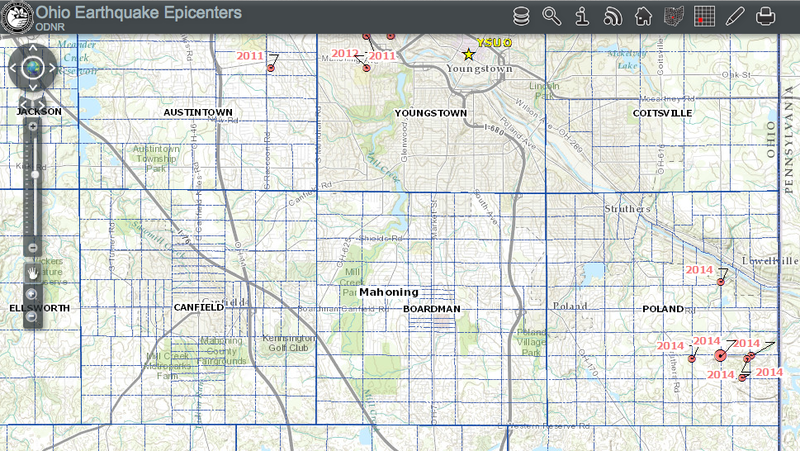 The Ohio DNR provide interactive maps for both wells and earthquake locations. Well worth having a play with both. Sadly though it is not possible to overlay them both, so the following images show the earthquake epicentres and the well locations. Firstly, note the large number of green dots in the centre of the well map. As I understand it, these are conventional wells drilled into a gas-bearing sandstone formation in the 1980s/1990s, so there is already a large amount of oil field activity in the area. Recent horizontal wells targeting shale layers are marked as grey arrows in the lower right part of the map. The earthquake epicentres can be seen in the upper plot, and appear to be in a similar location. So there does seem to be a clear spatial correlation with recent activity. 4. Earthquake depths can only be accurately determined if a local monitoring network is in place. Because this data is not available, the earthquake depths are not constrained. If you select the quakes in the ODNR viewer (use the 'i' tool) you will see all the depths set to 5km. This is seismologist short-hand for the depth being unconstrained. So we can't answer question 4. 5. For similar reasons, we don't have enough data to answer 5 either. 6. Hydraulic fracturing uses pressures high enough to create fractures in the rock. Therefore, for stimulation the answer to 6 will always be a yes - pressure at the well will be sufficient to trigger seismicity. 7. However, the press pulse is usually limited to a small area around the well, The "stimulated reservoir volume" typically extends only a few hundred meters from the injection point. Because these earthquakes are detected and located using distant seismometers, there can be over a kilometre of error on event locations. Therefore it is not possible to know whether the detected events are close enough to the wells to be within the stimulated zone. So to respond to the Frohlich criteria, we have 3 yes, but 4 don't knows. In all probability it would appear that these events have been induced by stimulation. But these events show the importance of good quality seismic monitoring during hydraulic stimulation. Fortunately, in the UK all stimulations will have to be monitored in this way. You can read about how Bristol University deployed seismometers to do this at Balcombe here. As for the wider implications? In terms of energy technologies, fracking still doesn't make it into the premier league (to quote Prof Richard Davies). Hydroelectric dams, conventional oil and gas extraction, coal mining, geothermal, waste fluid injection (which would include carbon capture and storage) all have demonstrated potential to trigger seismic activity. Anything that changes the state of stress in the subsurface can cause a fault to reactivate. Crucially, a fault near to it's critical failure point is required. These activities do not create earthquakes "from scratch". They bring forward in time an earthquake that would have happened at some point in the future (maybe in a year's time, maybe in 1000 years time, we don't know). This is known in seismology as "clock advance". It has been suggested that the maximum earthquake size that can be triggered is related to the injection volume. The larger the injection volume, the larger the earthquake that can be produced. This is why disposal wells, which are taking the waste fluid from hundreds of individual wells, have been so much more seismogenic that fracking wells. With this in mind, hydraulic stimulation for shale is unlikely to trigger earthquakes with magnitudes larger than magnitude 3.0. This was one of the conclusions of the Royal Society report into shale gas. All of the events recorded in Ohio had magnitudes between 2.0 and 3.0. Magnitude 3 events are large enough to be felt by people at the surface, but not sufficient to cause damage to buildings or surface structures. Earthquakes (naturally occurring this time) have made the news in the UK this week, with a magnitude 3.5 event occurring in Rutland. Magnitude is a logarithmic scale, so the Rutland event was was 6 times larger than the largest Ohio event. The Rutland event has been described variously as "it felt a bit like standing right next to a tumble drier", "it sounded like a loud train rumbling", while England fast-bowlers past and present seemed particularly involved, with Matt Hoggard describing it as “like a massive train going past outside”, and Stuart Broad noting that his mum's tea was knocked off the table. To conclude, it seems likely that the quakes felt in Ohio were triggered by stimulation. However, we really need better data, which is why monitoring will be required for all operations in the UK. The overall context is that shale extraction is no more likely to trigger seismic activity than other forms of energy production that we are familiar with in the UK, and very unlikely to trigger events large enough to cause damage at the surface.